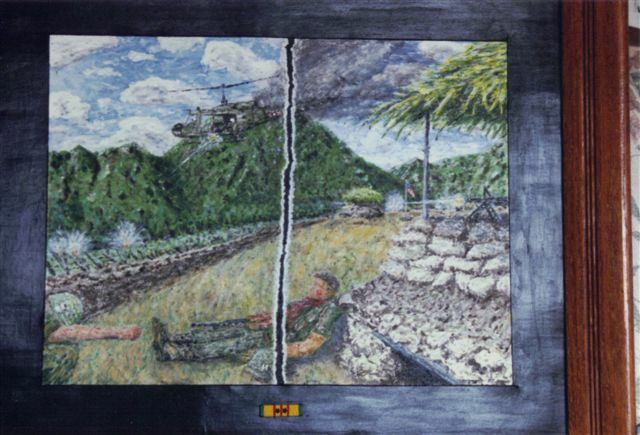 Painting from a Vietnam Vet. I was sent this painting by a Vietnam Vet who created this work to help out a fellow vet suffering from PTSD. I want to thank Bob for passing this on. I’ll be posting some of his work from time to time. The Veterans Art Foundation’s small and doesn’t have much in the way of space/money/equipment. However, we have something just as good, reach. While we may not have until we have sponsorship or a businessperson in charge (not me). We can provide opportunities. We’ll continue to open doors for Vets or act as a go between. Please utilize the opportunities to further yourself and your art (if that’s what you’re trying to do). It will benefit us by lending credibility and expose us to a greater audience. By this I mean art shows, film festivals, poetry collections, gallery openings, music promotion, dance and sculpture to name a few. I can understand struggle and failure. In the beginning I tried to publish a memoir with the funds helping the VAF. I was rejected soundly and gave up. It’s a bit different now. With the VAF we can breach the wall. There are days I doubt my own skills or ability to run the program. There are plenty of more talented people out in the veterans world who can benefit with our help. All it takes is an opening to make a mark on the world. Veterans, Cops, and other people in stressful jobs find it hard to admit they’re having problems. The main reason is dealing with the Stigma that comes with admitting mental illness. I was an infantryman for 4 years with the Stryker Brigade in Alaska. Infantry is full of alpha males and people who want to be perceived as mentally and physically tough. I was guilty of heaping some scorn on a fellow soldier for coming to terms with his issues. I thought I was tougher and less likely to suffer PTSD or other mental health issues. It wasn’t because I was tougher, I’d say. I was just calmer and rational about violence and stress. That was just in the moment, however. I tended to become emotional and angry after. I’ve been in fistfights, bar fights, and altercations since Iraq. I’ve also been recalled in the military after being out for 2 years. What changed my life for the better was realizing the problems I was having and becoming proactive. I’d accidentally fell into the vet center through a friend. It took years of work and medication to calm me down and put me on the right path. The Vet Center helped me form this nonprofit and set goals. The VAF’s where I want to work and create for the rest of my life. There are a number of resources for veterans. I’ll highlight the Vet Center today and more later. Active duty military have a hard time finding them or getting involved. I was lucky, but the word needs to be spread. Here’s a video and a link to the Vet Center homepage. They’re confidential. While under the VA, they’re not required to share information. Still working out the kinks. Sorry for the last post. It got all mashed together and looks shoddy. I am still working on the iPad’s word press app and need to work out the kinks. devastating explosion. The desert between the nations was lifeless.